Animal Crossing: New Leaf: Download new Animal Crossing: New Leaf fashions in New Style Boutique! 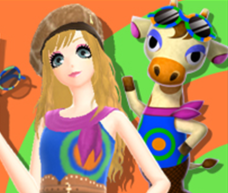 Download new Animal Crossing: New Leaf fashions in New Style Boutique! To celebrate the upcoming release of AC:NL, Nintendo has released two new Animal Crossing themed brands- Club Design and Giraffissima! :3 These can be downloaded in game.